Nintendo Announces Wii Mini Coming to U.S.
Nintendo has officially announced plans to release the Wii Mini with MarioKart Wii included in the U.S. available on November 17. The Wii console was a cultural phenomenon when it was released to the world in 2006. To continue this legacy and share the fun with as many people as possible, Nintendo is launching the Wii mini console in the U.S. at a suggested retail price of only $99.99. That is a tremendous value for families and people who have yet to join one of the most iconic and talked-about pop-culture trends of the last decade. Wii mini is a smaller, redesigned version of Wii that plays the entire library of more than 1,300 Wii games. 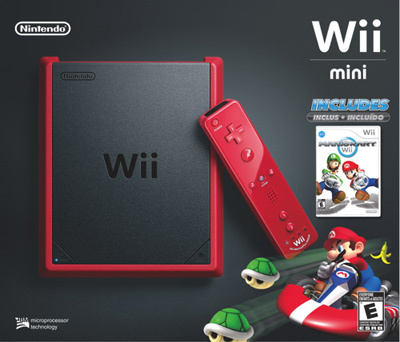 The compact system is matte black with a red border, and comes with the Mario Kart Wii game, a red Wii Remote Plus controller and a red Nunchuk controller. While availability will differ somewhat according to location, shoppers can expect to see Wii mini in stores by the middle of November. Wii is the best-selling system of this generation with more than 100 million units sold globally. Wii mini is for those who don’t own a Wii console and want to enjoy a ton of great Wii games on a stylish system at an affordable price. It is also for families who want an additional console in another room, allowing siblings and friends to play while the rest of the family enjoys other entertainment and games on the main living room TV screen. While Wii mini is not compatible with the Internet and will not allow online functionality when playing games, select multiplayer games can still be played locally with friends and families, which is the ideal way to enjoy such entertaining games like Super Smash Bros. Brawl and Mario Kart Wii.